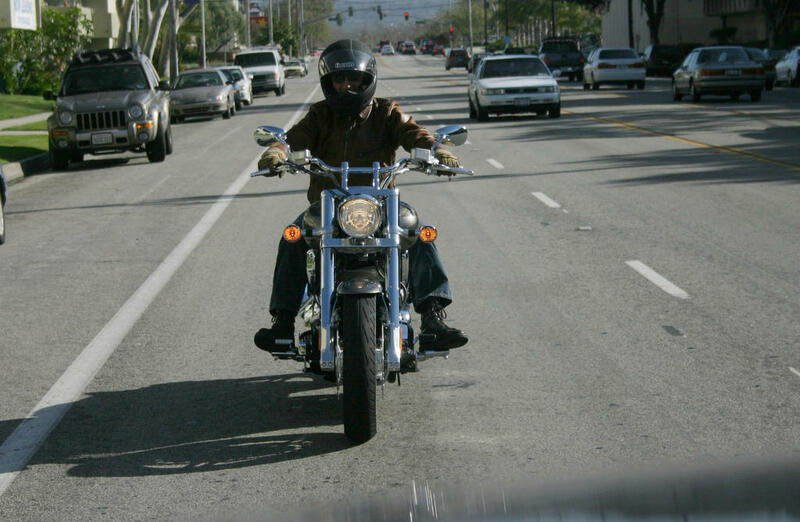 The different takes on cruiserdom was in full effect in the early 2000s, with the custom chopper scene getting most of the attention. However, the muscle cruiser crowd was also well represented with seemingly every cruiser manufacturer getting on board the bandwagon, stuffing big V-Twins into whatever they could. Honda’s big Twin was a 1,795cc, liquid-cooled stump puller first found in the VTX 1800 for model year 2000. Five years later we had this, the Honda VTX1800F. Same 1800cc V-Twin, this time wrapped in more muscular gym clothes capped with tribal graphics. You know, to really intimidate those other posers at the coffee shop. Despite its brawny appearance, however, the VTX1800F was actually a softy at heart. Sort of. 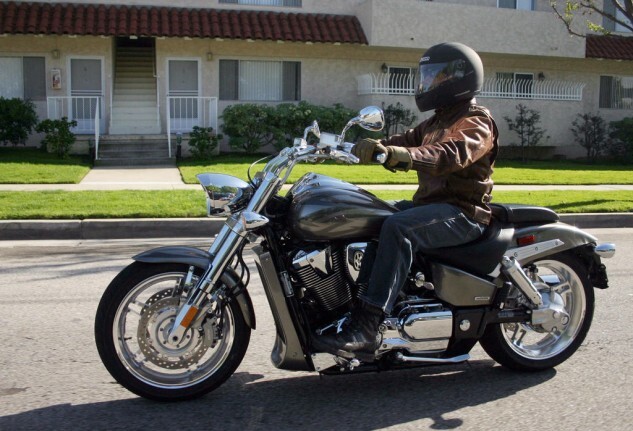 As Gabe Ets-Hokin describes in his review below, it does all the things you expect from a big cruiser, but it definitely isn’t for the novice rider. 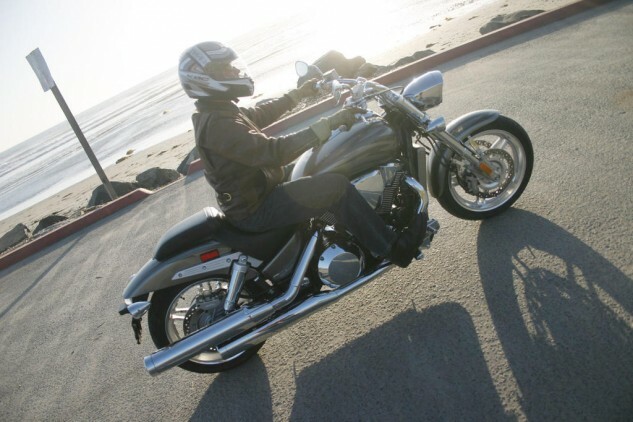 For more pics of the 2005 Honda VTX1800F, be sure to click on the photo gallery. Custom. Cruiser. Chopper. It seems as if every time you switch on the television, there is some tough-looking guy in a big garage with other tough-looking guys, screwing together wild-looking, stretched-out creations with chrome S&S motors. There is usually lots of facial hair, tattoos, yelling and cigars involved. The prices are astronomical, with a basic custom chopper starting at $20,000. Honda isn’t new to custom building: The Rune is Honda’s $27,699 custom-built masterpiece. However, the average consumer is going to be uninterested in rolling a $28,000 mass-produced work of art into his personal garage, instead choosing to purchase something they can ride everyday. How well does Honda do providing a custom, extreme-chopper riding experience to the average guy? 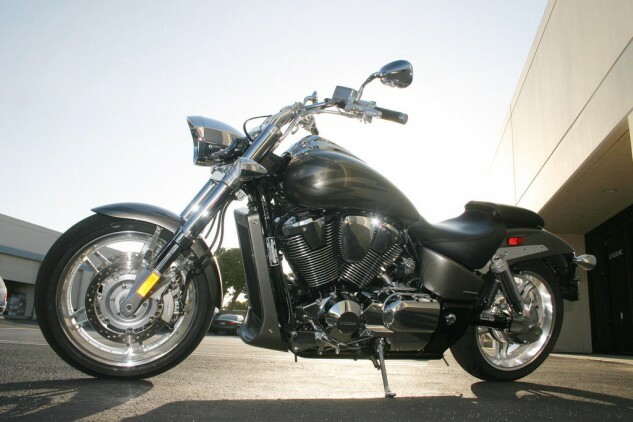 In 2000, Honda introduced the VTX 1800, the “most extreme production V-twin cruiser ever.” It’s extreme because of its 734 pound *claimed* dry weight, 67″ wheelbase, and massive, coffee-can-like 101 millimeter pistons. Big, bad and expensive…and we’re just talking about Gaybar. How do you top that? By reorganizing the VTX 1800 lineup to allow for more personalization. For 2005, Honda buyers can go to the Honda website and order their VTX 1800 online. Honda offers C, F, N, S and R models of the VTX 1800. The models are all identical mechanically, but offer different exhausts, mirrors, fenders, handlebars, tank badges and wheels. In addition, the customer can pick different “spec” levels. The “F” is new on the scene for 2005. It offers cast wheels, low bars and chopped fenders. The F is available in three specfication levels. Our test bike is a spec three, with plenty of blacked out, polished and otherwise swankified bits. It’s all topped off with a platinum-painted tank with the tough-guy approved tribal flame motif. All of this comes at an MSRP of $15,399. In terms of build quality and appearance, this pricing is steep but worth it. The VTX 1800 F presents a low, mean, hulking and muscular shape. Honda’s styling department can design a bike with nice proportions when they want to, and this machine is evidence of it. Every part works as a whole with the rest of the bike: the tires are sized properly, the 45-millimeter fork legs are beefy but not too hulking, and the large engine is capped with a delicately curved teardrop tank, matching the curving profile of the liquid-cooled, 1,795 cubic centimeter mill. The tank nicely mirrors the lines of the engine. 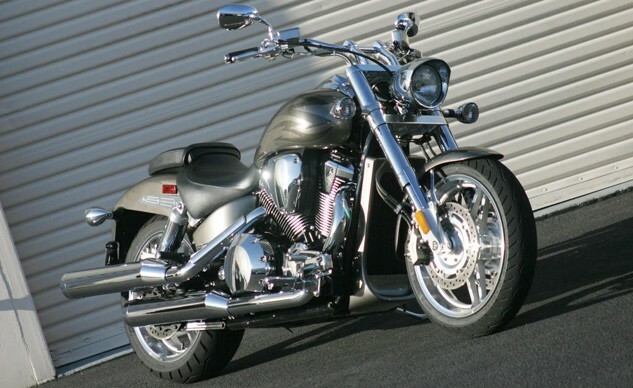 The “F” model delivers slick, power cruiser styling with lower bars and cut-down fenders, as well as low-profile radial tires. Steel is utilized for the fenders, but not for the side covers and speedometer trim. The rear fender is shorter than the other models and is topped off with a fashionable-and-bright LED taillight. Almost every part is chromed, polished or fashioned from “billet look” cast aluminum. The paint is a tad orange peeled, but glazed with deep clear coat for a custom look. However, decals are used for the tribal graphics instead of paint. This may seem like a nit pick, but it’s apparent even from 10 feet away, and this is an expensive, “custom” bike after all. Since we’ve absorbed the visuals, it’s time to swing a leg over our new possession. Flicking the key to the “on” position under your left thigh, the instruments respond with a little light show on the digital, tank-mounted speedometer and tach. The bike is fairly easy to hoist upright, thanks to a low center of gravity and wide bars. With the wide clutch lever pulled in, the starter cranks the huge engine to life. The biggest twin made by Honda makes typical big twin cranking noises, coughs a bit, and fires up into an immediate and slightly syncopated idle. To my ears it sounded good, but to other, more discerning staff ears it sounded like a typical Metric cruiser, only bigger. It does sound good to the rider, but the sound is oddly muffled behind the bike. Those big round end cans choke off a little too much sound for most, and will probably be quickly consigned to eBay. 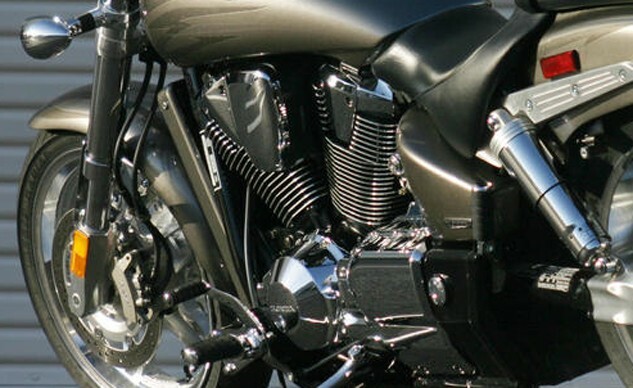 This could have been stamped and chromed steel, but the faux-billet fender support adds a touch of class. Strapping the really big twin to the dyno was exciting. I’ve never seen the dyno shake like that! The VTX 1800 delivers 100 foot-pounds of torque to the unfortunate rear tire, with a satisfying 86 HP as well. Note in the dyno chart how the engine delivers almost 75 foot-pounds at 1,250 RPM! I get a nosebleed just thinking about it. 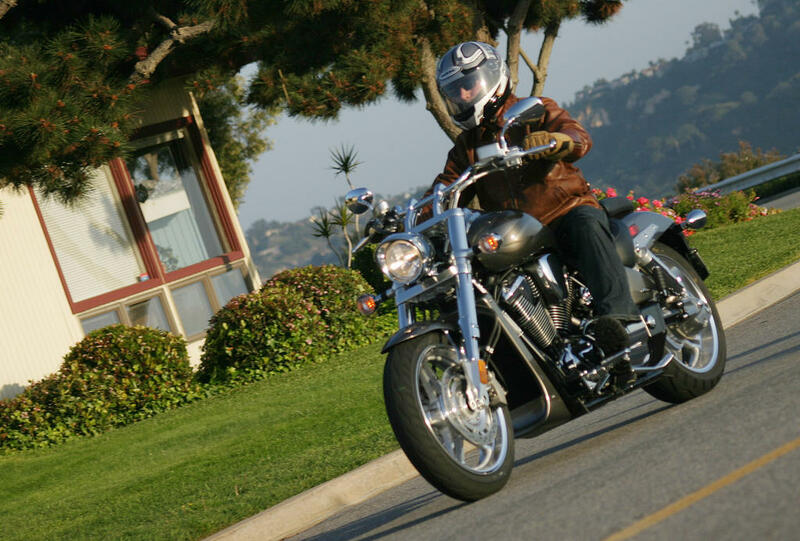 It’s now time to ride, so we click the gearshift smoothly into first and slowly engage the buttery hydraulic clutch. Immediately, this engine’s primary charm- lots of torque- jumps out at the rider like a playful, yet large, puppy. The bike chugs forward without much throttle. In fact, this beast can start in any of the first three gears with minimal lugging! 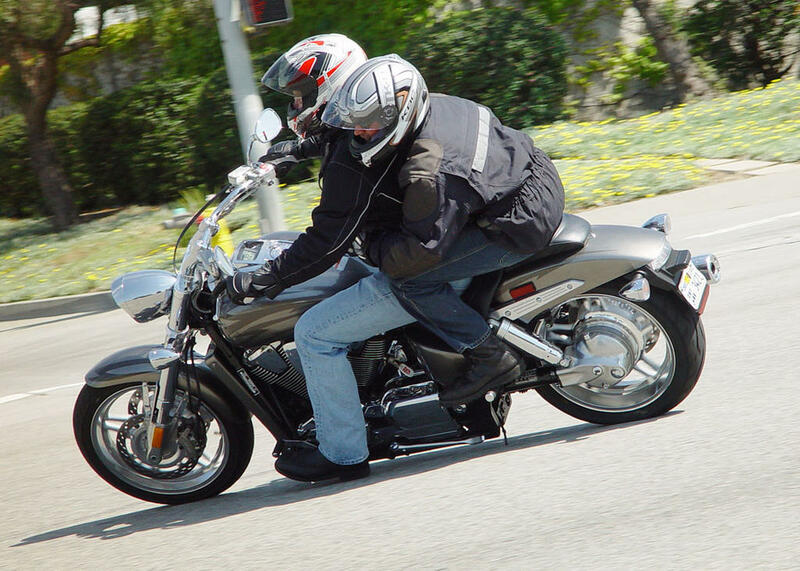 The VTX proves to be a comfortable companion for low-speed, boulevard cruising. The seat is very nicely shaped and supportive. The reach to the bars is similarly humane, not placing the rider’s elbows painfully high. The pegs, of course, are way out in front of the rider to insure plenty of cooling breezes riding up one’s pant legs. Tons of torque right off idle make the VTX a cinch to maneuver at low speeds. Passenger accommodations are a little more generous than what you would get from a custom shop, but it’s just a few steps above “after thought” in the comfort department. Although the pegs are fairly low, the passenger pad is hard and slopes away to the back. This puts the passenger’s pelvis at a funny angle and causes numb-bum after 10 or 20 minutes. Like the rest of the bike, passenger accommodations are best for short, around-town hops. Although it’s pushing 800 pounds with a full tank of fuel, the VTX doesn’t feel heavy or ponderous in traffic around town. The wide bars and 18-inch radial front tire make it easy to steer around bumps and chuckholes- which is a Good Thing, since the soft, short travel suspension tends to bounce the rider around a lot. The only time you really feel the weight is when you nail the brakes. The linked brake system- with dual 296 millimeter front discs and three-piston calipers linked to a rear single 316 millimeter disc and twin-piston caliper- is almost devoid of feel. 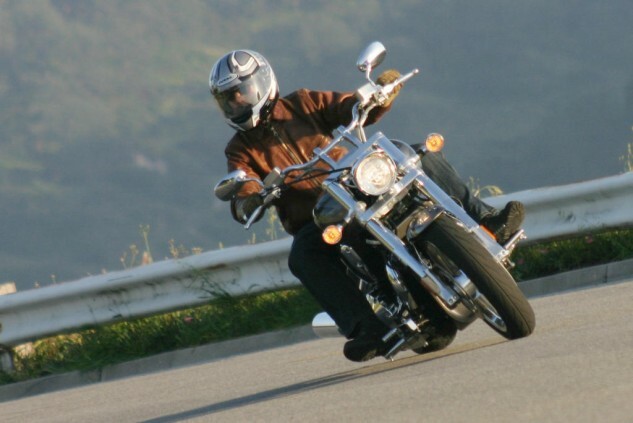 There is no skidding of the rear tire or stoppie-silliness with the front. The only thing squeezing both brakes hard simultaneously will accomplish is washing the front end with embarrassing results, unless you shift your weight far forward, which can lock up the rear tire for short distances. However, the brakes do get the job done, and should be very good for novice riders. Here’s one bike nobody can claim to not see. Novice riders? This is a huge bike. It’s tough to balance, and trundling it around your garage is slightly terrifying as you feel the heft of the thing the second it’s not balanced perfectly upright. New riders should look at a smaller cruiser, as the VTX doesn’t like to turn too quickly, and when a bike like this decides it wants to fall over or crash, it’s as inevitable as Publisher Alexander finishing an 18″ sub sandwich. “This thing is built for highway on-ramps” said MO’s Photographer and tech geek Fonzie, and the rest of the staff agrees. Opening up the throttle at the bottom of the on-ramp rockets the bike and rider forward on the aforementioned wave of torque, and before you know it, you are shooting down the freeway, weaving past the trucks and vans in the slow lanes, and plotting a course through the suicide bombers in their SUV’s and luxury sedans who are also weaving through traffic at high speeds. But once you achieve high speeds it takes a great effort to stay on the thing. This is a state endemic to all cruisers as your chest catches the wind like a sail, straining your upper arms, and you push down with your feet to keep them from floating off the pegs. It’s actually an excellent isometric workout. After one 150 mile freeway and twisty-road ride, I felt like I had been working out all morning. Six months of that and I’ll look like the Governor. But the motor makes loping along at 80 MPH effortless work, ticking over at just about 4,000 RPM while still allowing a quick 90 MPH pass with just a quick flick of the right wrist. A windshield would surely lessen the grunting resulting from the struggle to stay aboard in the gale-force winds at those speeds. In fact, adding a windscreen and bags makes a VTX 1800 into a competent tourer judging by the photos and postings from the stout and hearty fellow at the VTX owners’ forums. It’s not like Im’ Ben Spies or anything, but just give me a little more lean angle than this! It’s not the most economical of touring bikes, though. Even though it can lope along at freeway speeds with just under 4,000 RPM on the slightly busy tachometer, the VTX 1800 F delivered an average of 31.8 MPG in the course of our testing. I don’t know if adding a small windscreen would help. But nobody buys an “extreme cruiser” for fuel economy, right? After 50 miles of interstate it was time for the Ortega Highway, 30 miles of smooth, flowing curves. The VTX 1800 F did well on twisty roads…for a cruiser. It felt stable yet easy to steer, and the nice radial tires (a Dunlop D251 130/70R-18 in the front, Dunlop D251 180/70R-16 out back) seemed to grip nicely. The suspension was soft and had too little travel in the rear (surprise! ), but the main limiting factor was, of course, ground clearance. But let’s get back to the real world of cruising. This bike was designed to be the biggest, baddest mo-fo of cruiserdom, a showpiece for Honda and trophy bike for the masses. As such, the mission is thoroughly accomplished. The VTX 1800 F provides low, long looks, trendy dragbike/performance custom style, and a wonderfully torquey, user-friendly engine, clutch and transmission. The build quality is fantastic, as we expect from Honda, and it is as easy to ride as an 800-pound gorilla like this could possibly be. If you’re in the market for one of these things, you can ride into the sunset knowing you made a good decision. Of course, the 1800 doesn’t handle like a sportbike, nor will prospective consumers expect it to. It does work with typical Honda refinement, at least as well as a cruiser this massive could. For a rider who wants custom style with hot-rod performance, but who can’t afford-or want to deal with- buying a one-off chopper from a custom builder, the VTX 1800, in any guise, should be a great choice. Dealer installed accessories include a small, hairy man who clings to your back. Gabe wanted to sample the VTX’s passenger accommodations and I felt like demonstrating its ability to leave smoky black lines for him. So, here’s a brief riding impression from an overweight, under-matured racer type. The VTX is a kick in the pants to ride. There is more torque than you need all the way from its 1,000 RPM idle through its 6,000 RPM rev-limiter. Unfortunately, that rev limiter stops the party before most bikes are entering their “midrange”. Enough with the whining, even when shifted below five grand, the VTX is happy to light its tire and leave lurid black stripes through any intersection you care to abuse. Responsible riders might be better served by looking elsewhere, but hooligans can happily terrorize their fellow motorists at will. If you study the dyno chart, you’ll see that the VTX makes in excess of 75LbFt of torque before 1,250 RPM! That’s enough torque to light the tire while strapped to the dyno (an MO first). Ok, back to the whining: the VTX’s modified-Gyno riding position is less than ideal, but still sufficient to allow peg-dragging at parking lot speeds. I know it looks “cool”, but I think it’s a shame that a motor with this much potential is saddled with so much weight and so little ground clearance. On the other hand, the VTX offers nice attention to detail and typical Honda quality everywhere, except for the cheesy finish on its top triple clamp. It is also smooth and easy to ride with a palpable feeling of quality and durability. 1 year Transferable, unlimited-mileage limited warranty; extended coverage available with a Honda Protection Plan.